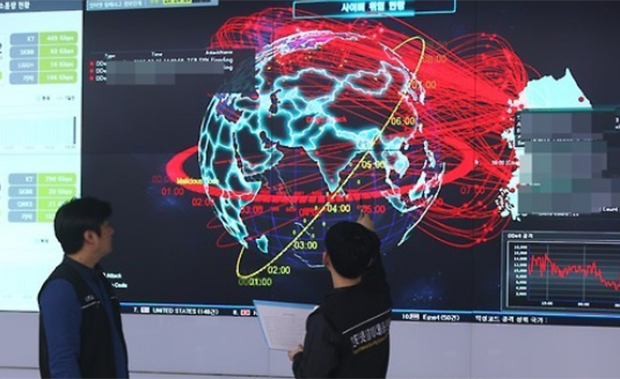 South Korea is considering drawing up rules of engagement in cyberspace to effectively deal with growing threats from North Korea and other unidentified players, military authorities said Sunday. "Since 2004, discussions have been under way at the UN meetings to enact international laws related to cyber war," a source told Yonhap News Agency on condition of anonymity. "We will closely watch the relevant situations and cautiously review and push for drawing up the rules of engagement." The envisioned rules of engagement are expected to provide a detailed guideline on how to respond to cyberattacks as soon as threats are detected. The military is also said to be developing its own cyber countermeasures, though details about what kinds of tools that can be employed have not been known. The move comes as the number of cyberattacks against the country's military has been on a steady rise in recent years. According to the data, there were 3,587 hacking attempts against the defense ministry and the military from January to August this year. This compares with 1,434 cases detected during all of 2013. Of the 16,931 attacks detected from 2013 to August this year, North Korea has been confirmed to be responsible for 244 cases. Most others are presumed to originate from unidentified players in third countries.